« Campout 11:15 Johhny Hickman Chris LeRoy Dangers! Meet the Hoppers! Kimmel, Eric A, Isaac L. Peretz, and Jill Weber. Even Higher! : A Rosh Hashanah Story. New York: Holiday House, 2009. Author Eric Kimmel uses an old Ukranian drinking song to help retell a famous Yiddish short story about a rabbi who skips town every year right before the holidays. Gerstein, Mordicai. The White Ram: A Story of Abraham and Isaac. New York: Holiday House, 2006. Caldecott award-winning author/illustrator Mordicai Gerstein retells one of the scariest and most puzzling stories of the Bible. Wayland, April H, and Stéphane Jorisch. New Year at the Pier: A Rosh Hashanah Story. New York: Dial Books for Young Readers, 2009. 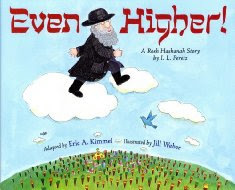 This wonderful picture book about celebrating Rosh Hashanah in Los Angeles won the 2010 Sydney Taylor Book Award. I had the pleasure of sitting next to the author at an ALA function a couple of years ago. She was very bubbly. *Literally–we live about 3 blocks away from a major Chabad center.